This easy holiday appetizer for Baked Meatball Wontons was created as part of a sponsored post for Daily Chef – Casa Di Bertacchi meatballs which are available at Sam’s Club. We had our first significant snowfall here in Minnesota! Winter is officially underway and the kids are so excited. Today is also the official start of the December holiday parties for us with my husband’s work party tonight. When planning holiday parties, one of the most important things is always the food. 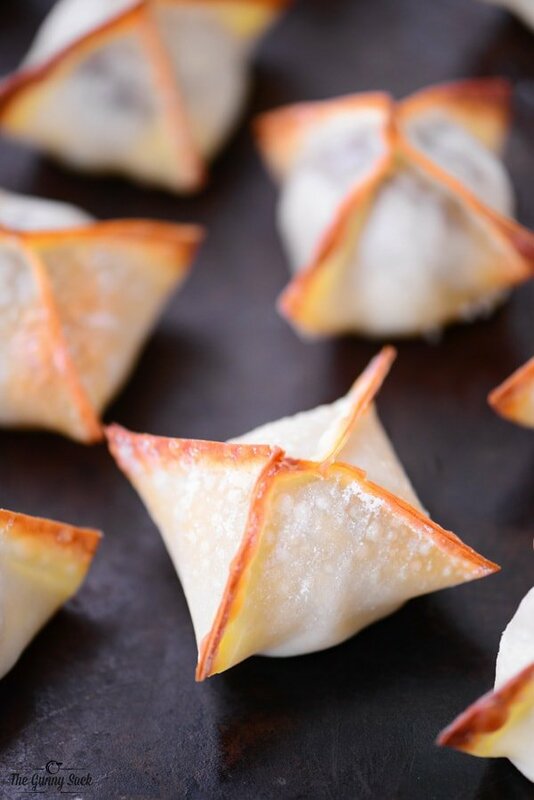 I decided to try making a holiday appetizer using wonton wrappers. This was my first experience with them and they were super easy to use. 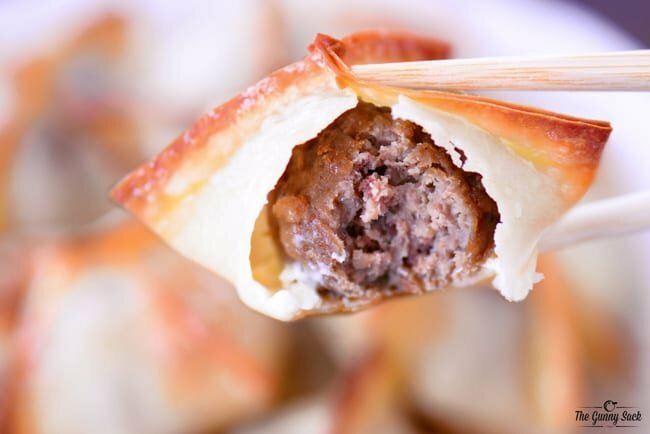 This recipe for Baked Meatball Wontons is perfect for parties with a meatball and cream cheese wrapped in a crunchy wonton! These Baked Meatball Wontons get their delicious flavor from the Daily Chef – Casa Di Bertacchi meatballs. We love Daily Chef – Casa di Bertacchi meatballs for meals and for appetizers! 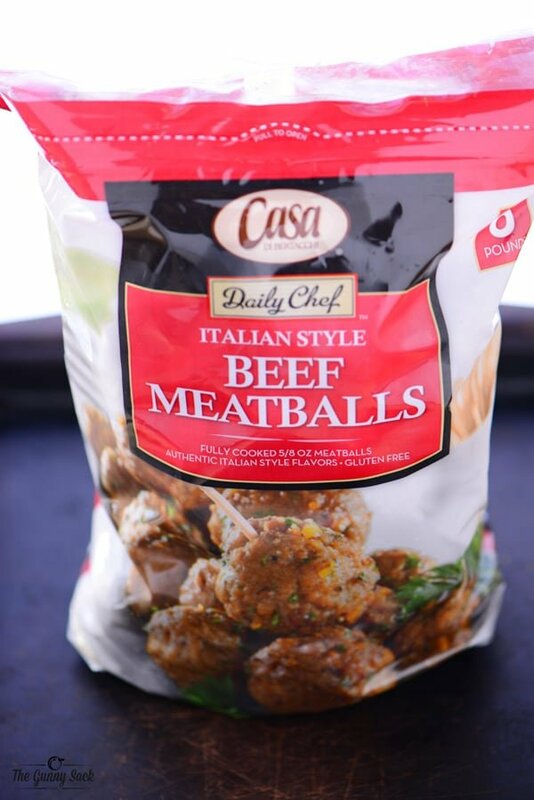 These fully cooked, gluten free, Italian style beef meatballs are available at Sam’s Club. Each bag contains six pounds of 5/8-ounce meatballs in each bag which is perfect for entertaining. They are easy to prepare and full of flavor. I brought some to a ladies night recently and everyone kept telling me what fantastic meatballs they were! 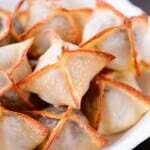 For each wonton, place about one teaspoon of the cream cheese mixture in the center of a wonton wrapper. Top with a cooked meatball and moisten the edges with beaten egg. 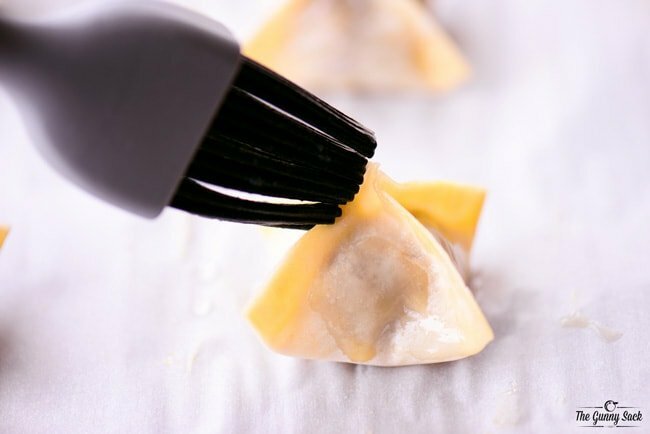 Kitchen Tip: The wonton wrappers dry out very quickly so be sure to keep the package and the prepared wontons covered with plastic wrap. Bring two corners up to meet of the top of the meatball and press to seal the corners together. Then, bring up the other two corners, pinch together at the top and press the seams together. Brush the wontons with melted butter. Bake at 400 degrees for 10-12 minutes, until crispy and golden. Serve immediately while still warm and crispy. They are perfect just as they are, but you can also serve them with a warm cheese dip or a creamy dip such as dill or ranch. 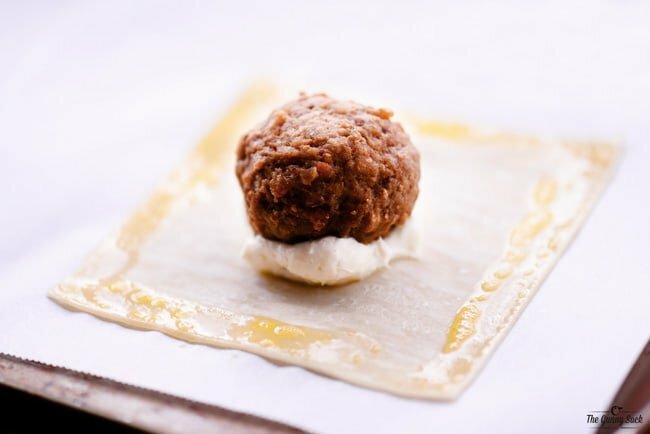 This Baked Meatball Wontons recipe is a delicious party appetizer with a flavorful meatball and melted cream cheese wrapped in a crunchy wonton! Place frozen meatballs in a large, microwave-safe casserole dish. Cover and microwave on high for about 5-6 minutes, stirring every 2 minutes until heated through. Beat softened cream cheese. Add powdered ranch seasoning mix and milk, beat well. The wonton wrappers dry out very quickly so be sure to keep the package and the prepared wontons covered with plastic wrap. Yum! I love using wonton wrappers to make unique appetizers. I’m thinking this would be a winner at a Super Bowl party! I made these for a Christmas Eve Party and they were a huge hit! Everyone loved them and were amazed when I told them how easy they were to put together. 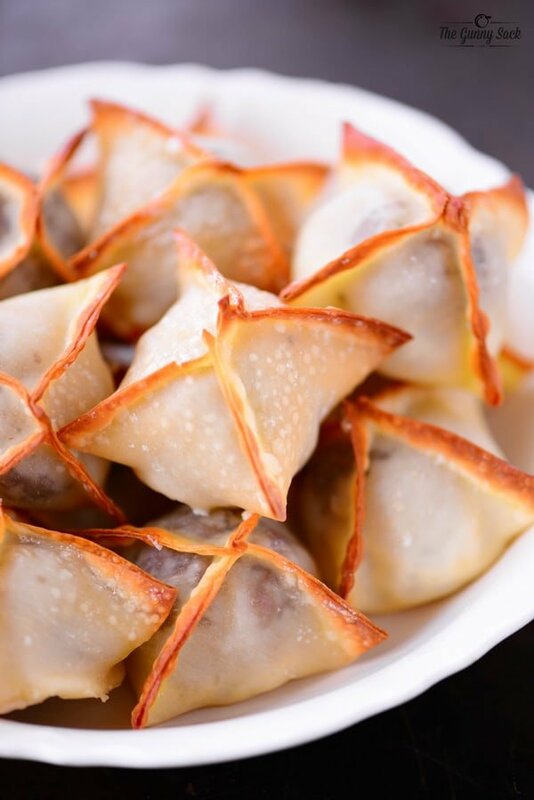 I LOVE to make baked wontons, and I have never thought to put premade meatballs in them! This is GENIUS! These are adorable! The boys in my house would love these, and they are perfect for football Sunday too! This is such a great finger-food idea! Thanks for sharing! YUM YUM YUM!!! These are so perfect for NYE! These look so simple and yummy! What a great idea for a last minute appetizer! What could be better!! These sound so good!! And I love that they’re wrapped in wontons. Awesome idea! I’m a little jealous about your snow! We won’t get any until like Feb probably haha. My husband would love these meatball wontons! What an awesome holiday appetizer idea, Tonia! 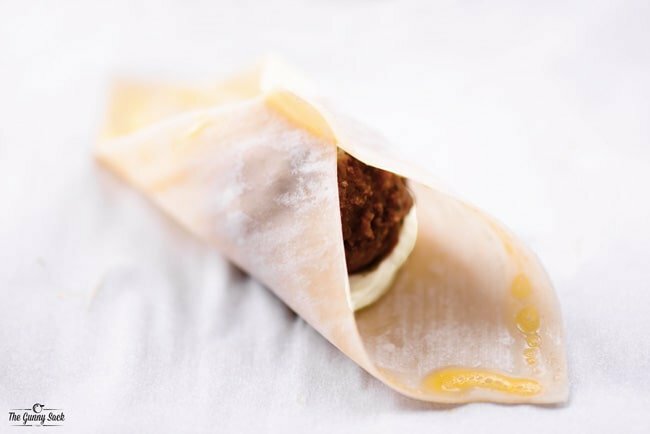 Love that cream cheese mixture with the meatball – a perfect combination! Hi Tonia! What perfect little packages just in time for the holidays! And quick and easy makes them even better!